House Republicans released their FY 2016 General Fund budget targets on Wednesday. And for the fifth year in a row, House Republicans have proposed a budget that spends less than the state will take in. For Fiscal Year 2016, the state would spend $7,168,144,634 out of the General Fund. This amount to a 2.48 percent increase in state spending and spends 99.9 percent of the Revenue Estimating Conference’s latest estimate for ongoing revenue in FY 2016. As has been stated since the start of the session, K-12 education is getting the first bite of the apple, with funding for year two of the Education Reform legislation from 2013 and a 1.25 percent increase in supplemental state aid to schools. Also, the increase in funding for continued implementation of the commercial property tax reform legislation is included as well. The budget will also address mandatory increases in Medicaid due to further declines in federal funding participation. House Republicans believe that it is important to lead by example when holding the line on spending. They are doing this by reducing the Legislature’s own budget by over $1 million below the FY 2015 level. Additionally, funding for organizational dues has been removed from all budgets. The Executive Council will be given a set amount of funds to pay for organizational dues that it has given approval to. As the current round of early retirement benefits comes to a close on June 30, the funds spent in this program are being repurposed to other areas. The Iowa House voted overwhelmingly to approve a bill designed to expand high-speed Internet access in areas of the state with slow internet speeds. The bill passed on Tuesday with broad bipartisan support, 90 to 5. Internet service providers that choose to build high-speed internet infrastructure within areas that have slow service will receive a ten-year property tax exemption on their new investments. The bill, known as the “Connect Every Acre” initiative, also establishes a grant program that can provide financial assistance to providers building high-speed infrastructure. Both the property tax exemption and the grant program require the providers to build infrastructure that can facilitate 25 megabits of download speed and the three megabits of upload speed. Governor Branstad and Lieutenant Governor Reynolds applauded the bill’s passage Tuesday in a statement, comparing the importance of extensive high-speed Internet connectivity with the states road and interstate system. -Identifies the State of Iowa CIO to coordinate statewide broadband availability and access between the public and private sector. -Creates the Iowa Farms, Schools and Communities Broadband Grant Program to award grants to communication service providers to invest broadband access to farms, schools and communities. -Provides a 100% property tax exemption for broadband infrastructure built within a “targeted service area” with relatively low Internet speeds. -Streamlines the permitting process by requiring permitting authorities for non-wireless broadband related permits to be done within sixty business days. I got to meet Wisconsin Governor Scott Walker on Tuesday. He was in Des Moines to talk with legislators as he considers a presidential run. For an hour, he discussed his upbringing, the economy, and foreign policy with members of the House. I had the opportunity to act as the House Majority Leader for a morning this week. The Majority Leader directs the House in its daily business. She was in a meeting when we gaveled in on Tuesday. Since I am an Assistant Majority Leader, I stepped in to fill her place. The Speaker recognized me when each new piece of business came up. I held the Majority Leader’s spot until we recessed for the morning. 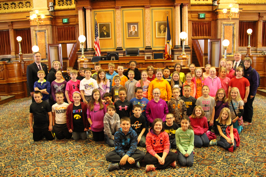 Fourth grade students from Lambert Elementary in Manchester were at the Capitol this week. They received a tour of the building and got to go into the House and Senate chambers. I talked to them about the law making process and answered questions about the House. I managed a bill on the floor of the House this week dealing with air quality. Here is some history on the issue. The Air Quality Bureau within the DNR is funded by fees paid by companies who emit pollutants into the air. The amount of pollution has decreased due to increased federal regulations and pollution control technologies, which is good news. However, the Department’s budget has continued to increase. At the close of last year’s legislative session, the legislature requested the DNR convene a stakeholder group to come up with funding recommendations for air quality. The recommendation includes implementing a new fee program. HF 640 is a combination of stakeholder recommendations and budget practicalities. Key provisions in the bill include establishing a Title V operation permit. Currently, only emission fees are collected for Title V. The language allows the commission to set and collect the operating fee, capping it at $1.25 million. The bill sets parameters for the funds allowing them to stay within the DNR and carry forward. The bill requires a stakeholder meeting to be held for Title V fee payers with the DNR annually.